There are many ways that teachers try to reach students, but none, perhaps, are as effective as the illustrative example. Case in point: Daniel F. Davis was teaching a class where was he trying to explain the crouch that runners use to begin a race. At first, Davis tried to describe the crouch. Then, the 70-year-old went further: he broke from the lesson and performed the crouch himself, lowering to all fours. Davis, a clinical assistant professor of education, died on Oct. 19 of a heart attack in Udaipur, India after teaching classes in Mumbai. He was 70 years old. Described by colleagues and students as a “compassionate,” “humble” and “humorous” teacher, Davis grew up in Coney Island, New York, according to a death notice published in The Boston Globe. He received his bachelor’s degree at Owego University B.A., and later received his master’s at Brooklyn College and a Ph.D. from Ohio State University. For 30 years, Davis worked at Stoughton High School in Massachusetts, teaching social studies and eventually becoming school principal. He left the school eight years ago to teach at BU, where he worked with “everybody from freshman advisees to doctoral students,” Tate said. 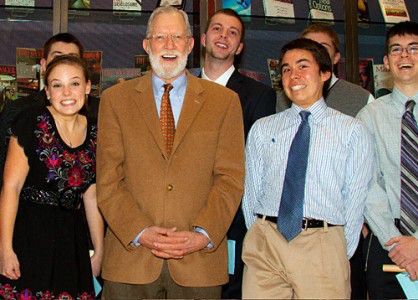 “I personally will remember him as a passionate man constantly in the service of his students, and of education in general,” said former student Scott Delisle, SED ’13, in an email. Though colleagues regarded him highly, Tate said, Davis was a humble man. He used to stop by the offices of other professors almost every day to say hello and ask for advice. “I used to think why is this expert teacher asking me for advice?” Tate said. But whatever answer Tate gave, he said, Davis would take seriously. Cottle a kiss on the cheek and hugged him. “He was a loving guy. I have no problem revealing that,” Cottle said. Davis will not have his influence end with the students he worked with, Cottle said. Rather, his influential style will ripple onward. Davis leaves his wife of 48 years, Barbara; his son, Jeff Davis; his daughter Jill Davis; his sister, Gwendolyn; and four grandchildren. I just learned of this very sad news today, May8, 2012.. Mr Davis, as he was referred to at Valley Stream North High School was by far the best teacher I ever had. I do not know how he did it but I was always labeled a classic underacheiver before he worked into my 9th grade classroom in 1966.. He managed to ignite my quest for knowledge and my enjoymnet of education. He was the Social Advisor for my grade, the Valley Stream North High School class of 1968. He united our class and made a major impact on many of my classmates too. I hope he is now in heaven being the fabulous teacher and social advisor he was to us. I know heaven will only be better for his presence. My sincere condolences to his family and my gratitude for their willingness to share him with so many students so so many years. natural interest in all students was contagious. Mr. Danny Davis was one of a kind. My most vivid memory of him was from June 1968. I was on a bus headed to the beach with my high school class — it was our senior day — and the night before Robert Kennedy had been assassinated. I was crying on the bus, wondering what I was doing there while the country was mourning Kennedy’s death. Mr. Davis sat next to me and comforted me and encouraged me to always fight for what I believed. I went on to be a student political leader at BU, SFAA. In Mr. Davis’ sociology class our eyes were opened to social issues. We went on a field trip to Greenwich Village! We talked about aging and the elderly. He was inspiring in so many ways and I will never forget him. I am a teacher and I like to think I’m a bit like him. Good-bye, Danny Davis. Dan Davis was one of the most positive influences in my life at that time and into the future. He taught me about learning and that I could be a good student and learn “hard stuff”. Everything I know about Russian history comes from what we learned in ninth grade. In sociology in the twelfth grade, I learned how to look at social issues from a diverse and challenging perspective. I remember reading the Moynihan book, The Melting Pot, and felt that I was being trusted with a book for “college students”. He gave me an opportunity to grow in ways that he may never have realized. I now work in education Monday through Friday and in counseling psychology on the weekends. Thanks Mr. Davis. Rest now, Daniel Davis. We loved you. My condolences to all – his family and his obviously extended family – the class of ’68. I’m from the class of 67 (I dated Sheila Brayman and was in a band – the Valstrum 5, played varsity soccer and drove my Camaro SS too fast). Reading the words of Aileen (think I new your brother), Iris (Hi, to 1/2 the Hausmam twins), Lee (say hello to Larry), and Dale, it is obvious that he impacted everyone he met. I do remember that all the girls wanted to date him and the guys probably wanted to be him. It was more than his looks or his resemblance to the actor James Franciscus, but you all know that. Just look at the faces of the young ones surrounding him in the photo above. Even at 70 it is obvious that he stayed true to himself and changed the course of so many lives. It is scary when you realize that some of our teachers, and especially our Social Advisors were not much older than we were. I guess it was the white shirt and tie that made them seem much older to us. Mr Davis was only 7 years older than me – that is scary. A few years ago I went to complain to the superintendent of schools of the school district that my kids were in on Long Island. I walked in and who do I find by my Social Adviser, Mr. Von Novak (William). He was about Mr. Davis’s age. I said yes since subconsciously I think I was using VSN as the benchmark. He then told me that VSN did not exist anymore. He told me that back then everyone rowed in the same direction, whereas now the parents and the students from diverse backgrounds were all pulling in opposite directions. I guess even though I was Catholic and Italian-American, while most of the school may have been Jewish or Protestant from differing European ancestries, I was thought that we were different. We only seemed to care you scored better on the Regents Exams. Reading the touching words of the 4 above, it made me realize that we were lucky having gone to VSN. Some had a little more money than others, but none of us was starving. But what we left with from VSN because of the teachers like Mr. Davis, turned out to be priceless. I know I did not appreciate the level of teachers that we had, or the impact that our social adviser’s had on us. It transcended grades and it all, no- they all contributed to making us better grownup wannabees. I have never written to the assoc, especially concerning the death of a “teacher”, but reading the responses above made me sad in a way. I hope that Mr. Davis, Mr. Von Novak, and so many of those who guided us found it fulfilling. I’m sure they knew that they made a difference in our lives. It is funny how much we did not know when we left VSN, but we were prepared for life – whatever direction it may have taken us. I’m 63, looking at a picture of a man of 70 surrounded by kids who obvious love him, and still wish I was him. Somethings never change. You said it all. Our education and experience at VSN was top notch and led us all to be inspired and contributing adults. Mr. Davis was my 10th grade Social Studies teacher in 1968-1969. I remember that he was very good looking and that he resembled James Franciscus. Interesting to find out that I wasn’t the only one who noticed this. I remember him telling us that he thought NASA, the space program, was important because it gave Americans something to “root for” that didn’t involve a war. And I believe he shaped alot of my liberal (or “progressive”, as in Senator Feingold) views on issues. He wasn’t afraid to discuss these things in our social studies class. If you are lucky, during your stay on earth you encounter certain individuals that touch and impact you in a way that their words and spirit stay with you forever. Dan Davis was that person to me, and I expect many others. Dan Davis was a giant among his peers, a wonderful teacher, and a beacon of light in a sometimes dark and dreary journery through HS. He was compassionate and and inspiring man, who was extremely generous with his time and advice. It is a blessing to have had him, while briefly, in my life and I’m sure all his former students, friends and family will miss him greatly, and the world of education and mankind has lost one of it’s brightest lights. God Bless you Mr D, your spirit lives on in all you left behind. Rest in peace Mr. Davis. You were one of those teachers who transform lives and for this i thank you and, as you can see from the others who have written before me, we thank you. Don Borgese, ex of the Valstrum 5 (what a memory that brought forth) said it all: “Just look at the faces of the young ones surrounding him in the photo above. Even at 70 it is obvious that he stayed true to himself and changed the course of so many lives.” Thank you Mr. Davis. You made a difference. I wish i knew you were at BU for the four years my daughter was. I can’t find a “comment” button at this point, so will have to content myself with “reply.” I was another of “Mr. Davis’s” studetns at VSN. Shortly after the assassination of RFK, he took another student and me to St. Patrick’s Cathedral in Manhattan to be among the mourners. We stood in line for a long time, then filed past and touched the casket. There are not many teachers who would have gone to that much extra trouble for their studetns. Mr. Davis taught us to challenge the prevailing wisdom, even to break the rules now and then. What a special educator it takes to teach students when to challenge authority. He was and is an enormous influence on my life. I have often wondered what became of him, and now I know more. I wish he had had more years to continue casting his spell. I guess I was the other guy, because I remember the trip. I thought maybe there was more of us, but I think I trust your memory more than mine. Hope all is well Eric.